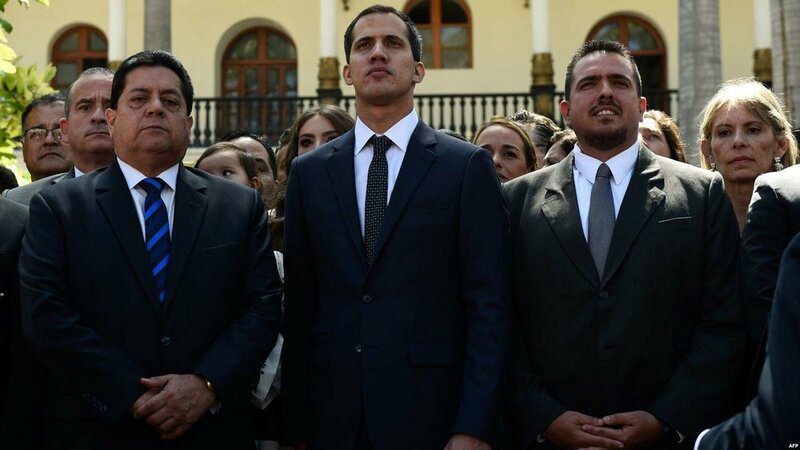 In the dramatic climax of an almost decade-long crisis, the president of Venezuela’s National Assembly, Juan Guaidó, declared himself interim president on January 23. Domestic protests against President Nicolas Maduro’s regime and widespread international support for Guaidó have brought the situation to a head, and Maduro’s regime is teetering on the brink of collapse. In this historic moment, Venezuela’s future rests in the hands of its military officers. Maduro’s legitimacy has suffered since the 2018 presidential elections, which were condemned internationally and domestically. The two strongest opposition candidates were both barred from running: one was kept under house arrest, and the other was prohibited from holding office over accusations of misconduct. The opposition responded by calling for a nationwide boycott of the election. Guaidó’s claim has already been recognized by over a dozen countries, including nearly all of the Americas and the United Kingdom. However, Maduro continues to enjoy the backing of Russia, China, Turkey, and Cuba, all of which enjoy either financial, energy, or ideological ties with his regime. On January 25, Reuters reported that Russia had in fact sent private military contractors to protect Maduro in the case of a coup. Amid all this international maneuvering, the most shocking defender of Guaido has in fact been the Trump administration. Despite American support and a “well-oiled diplomatic campaign,” however, there is widespread uncertainty about what will happen next. Maduro could decide to respond with repression, arresting Guaidó and crushing the domestic protests. But Maduro already lacks popular and international support, and the decision to respond violently would have serious implications. His remaining power rests precariously in the hands of the Venezuelan military. As Bruce Bueno de Mesquita and Alastair Smith explain for Slate, the loyalty of Maduro’s top brass rests largely with his ability to ensure “a steady, continuous, substantial flow of access to wealth and power.” Given that Maduro can continue to rely on substantial oil revenue and billions of dollars in investment from China and Russia, his ability to enrich and empower loyal supporters does not look to be endangered. But the soldiers on the ground may feel differently. While Slate highlights the Russian investment that continues to flow into Maduro’s administration, it fails to recognize that these funds are likely limited to high-ranking officials and Maduro’s cronies. According the Washington Post, the middle and lower ranks of the military are putting serious pressure on military leadership, as they have largely suffered alongside the rest of the population from hyperinflation and shortages of food and medicine. Venezuela’s military attaché in Washington announced on January 26 that he was breaking with Maduro’s regime, and this major move by the country’s highest ranking diplomat may provide lower-ranking soldiers with the vision of an alternative path. The opposition is also working to weaken the links between Maduro and the military, passing a law on January 15 that grants amnesty to soldiers who help push Maduro from power and restore democracy to the country. On top of these incentives, the announcement of $20 million in humanitarian assistance from the U.S. is significant, as it promises much-needed relief to soldiers and their families. All of these moves point to the centrality of Venezuela’s lower-ranking military officers in this historic moment. These are the individuals who hold the keys to Venezuela’s future. As domestic and international pressure builds to hold legitimate elections, their support will shift the balance of power. It would not be the first time lower-ranking military officials have changed the course of history. The decision by Soviet officers—made amid total confusion and unclear orders—to open the gate and not shoot those clamoring over the Berlin Wall in 1991 led to the fall of the Soviet Union and the end of the Cold War. The steadfast determination of Portuguese captains opposing the fascist Second Republic sparked popular resistance that led to a near-bloodless overthrow in 1974. Conversely, the enduring loyalty of the People’s Liberation Army in Tiananmen Square likely saved the Chinese Communist Party’s regime in 1989. Like these individuals before them, the officers of Venezuela’s military hold the future of the nation in their hands. Their decision to either follow military leaders and back Maduro or to heed Guaidó’s plea to restore democracy will determine whether the current regime survives the coming weeks.